Matt (Birbiglia) is a non-threatening every[funny]man who, presumably like his real-life alter ego, works out his issues through standup comedy (a concept seen recently in the QFest selection Nate & Margaret). He delivers his jokes with a wavering hesitancy that makes him seem like a modest guy, the type that you wouldn’t mind calling a friend. His girlfriend (Lauren Ambrose) is pressuring him into marriage, his parents are pressuring him to get a real job, and his fears are manifest themselves in his dreams, which in turn manifest themselves in his titular sleeping disorder. And the affliction, of course, lends itself well to both absurdist nightmares and awkward awakenings. The film has a loose format (still images, wall-breaking) and does have a few moments of inspired surrealism (see: pizza pillow) and cameos from a host of reliably entertaining faces (David Wain, Kristen Schaal, Marc Maron, Hannibal Buress, that guy from Girls), but even at a mere 75 minutes in length (sans credits) this thing is really tough to get through. Maybe I’m just tired of seeing people whine about their parents or girlfriends. Or maybe I’m just tired of watching comedies that aren’t the least bit humorous. You’ll sleepwalk your way right out of the theater! Zing! 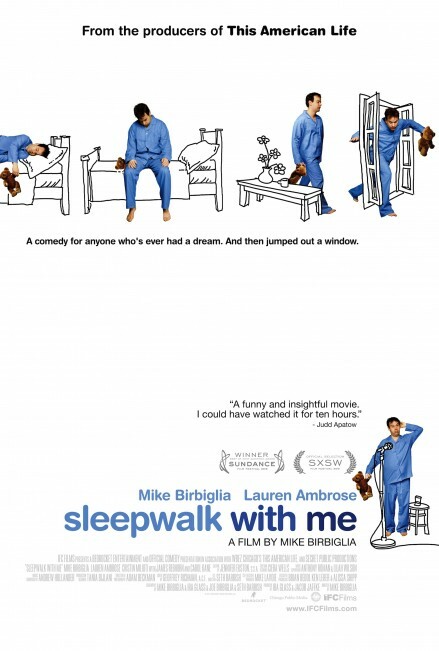 Sleepwalk With Me opens today at the Ritz at the Bourse.